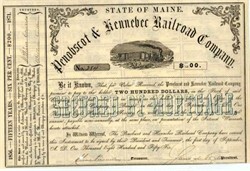 Beautiful certificate from the Penobscot and Kennebec Railroad Company issued in 1856. This historic document has a vignette of a railroad train steaming across the countryside. This item is hand signed by the Company's President and Treasurer and is over 151 years old. There are 30 unused coupons attached to the bottom of the certificate not shown in the scan. The genesis of Maine Central can be traced to two small railroads, one located in Calais and the other running between Bangor and Old Town. Both were granted railroad charters in 1832. The Calais Railway Company became the Calais Railroad Company in 1838 and in 1839 built and operated a two mile long horse railroad between Calais and Salmon Falls. The second railroad was the Bangor and Old Town Railway Company which was chartered to build a line between Bangor and Old Town. Before any track was laid the Bangor and Old Town Railway was sold to the rival Bangor & Piscataquis Canal and Railroad Company which had been chartered in 1833. The road was completed from Bangor to Old Town in 1836. The 12 miles of track of the Bangor & Piscataquis Canal was laid with wooden timber rails with a three-quarter inch thick strap of iron spiked to the top of the timber. 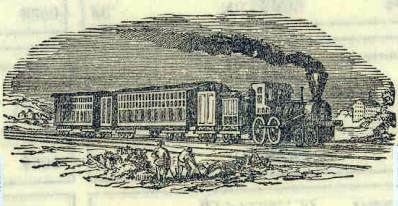 The railroad's first engine, the Pioneer, built by Stephenson & Son of England in 1832, was first used by the Boston & Worcester Railroad and then brought to Bangor in 1835. While passengers did make use of this little railroad, its principle traffic was lumber transported to Bangor, one of the most important ports on the East Coast. Three major railroads were to become the core of the Maine Central Railroad system. The Kennebec and Portland Railroad Company was chartered in 1836 to build a railroad from Portland to Augusta. The Androscoggin and Kennebec Railroad Company was chartered in 1845 to build a railroad from near Lewiston to Waterville. The Penobscot and Kennebec Railroad Company was chartered in 1845 to build a line from Bangor to Waterville. The Androscoggin and Kennebec was organised in 1847 and construction was started immediately at a final cost of about $2 million. The 55-mile long road was opened from Danville Junction, where it connected with the Atlantic and St. Lawrence, to Lewiston in 1848, to Winthrop in 1849 and to Waterville on December 5, 1849. The stock of the Androscoggin and Kennebec was owned almost exclusively by Maine people. At one time the stock was held by 1,854 individuals in 87 Maine communities, with only four out-of-state stockholders. The rival railroad to the Androscoggin and Kennebec was the Kennebec and Portland (later to become the Portland and Kennebec). The line was opened from Yarmouth Junction to Bath in 1849, from Portland to Falmouth in 1850, from Brunswick to Richmond in 1851 and to Augusta on December 29, 1851. The Kennebec and Portland also operated the Somerset and Kennebec Railroad Company which was opened from Augusta to Waterville in 1853, to Fairfield in 1855, and to Skowhegan on November 19, 1856. The Kennebec and Portland was the subject of bitter controversy for many years and control of the railroad had to be finally settled by the Maine Supreme Court. Richard D. Rice was the beneficiary of the battle for control of the railroad and he became president of the line. In 1870 the Portland and Kennebec was leased by the Maine Central which later became owner in 1874. Mr. Rice served as president of Maine Central from 1870 to 1873. The Penobscot and Kennebec was opened Waterville to Fairfield in 1853 and to Bangor July 30, 1855.